With the NHL Draft looming, it has been a crazy couple of weeks for former puck-rushing Bloomington Jefferson defenseman Joe Faust. While Faust has been interviewed by New York Islanders, New York Rangers, Pittsburgh Penguins, Chicago Blackhawks and New Jersey Devils, he isn’t particularly concerned about which team has the most interest or when he might be picked -- if he is selected at all (he’s projected as a potential late-round pick in the June 25-26 draft). Faust has been focused on getting his immediate future settled, and that includes extracting himself from what he described as a “sticky situation” with Princeton University. While high school and college hockey message boards and blogs have been buzzing about Faust backing out on his commitment to play at Princeton in favor of going to the University of Wisconsin, Faust says the reporting is only half correct. Faust, was a second-team Hockey Hub all-state selection last season as a senior when he scored 14 goals and added 32 assists. He stands a shade under 6-feet and has bulked up to 194 pounds this summer. He was heavily recruited by Minnesota-Duluth and turned down a scholarship offer from Wisconsin before choosing Princeton. Faust recently returned from a tryout camp for the United States Hockey League’s Des Moines Buccaneers. 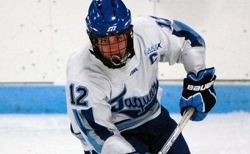 Faust, who was selected in the USHL’s draft by the Buccaneers, said he made the team that will also will include Andover’s Cal Decowski and Minnetonka’s Max Gardiner, two more Minnesota high school standouts from last season. Faust said he felt pressure to commit to a Division I program last fall, then didn’t think much about his college choice during the season. Faust said he made his decision official on June 15. “I told them this is what I really wanted to do and thanked them, because they certainly treated me well,” Faust said. As for the NHL Draft, Faust said he'd be thrilled to be selected by any team. "I’m excited about it," Faust said. "I hope to get drafted. I think every player does. But it’s certainly not the end of the road if I don’t."